A new Library Resources link now appears in the navigation for every course in Canvas. 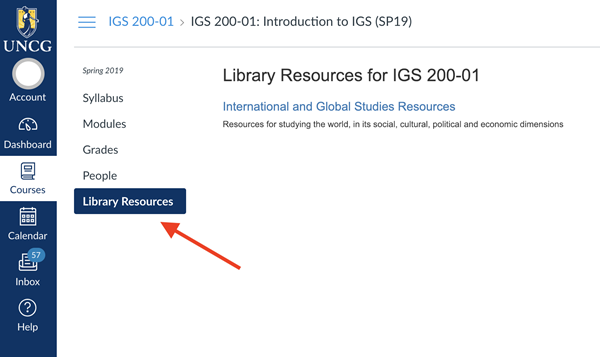 The Library Resources link directs both instructors and students to the Research Guide that a librarian curated specifically for the course and/or subject. If no Research Guide exists for the course or subject, a generic library guide will appear. Additional information can be found in the UNCG Libraries in Canvas Research Guide. If you have questions about the Research Guide that is linked in your course, please use the contact information in the guide to reach out to the librarian responsible for its content. Other questions can be directed to 6-TECH at (336) 256-TECH (8324) or 6-TECH@uncg.edu.